We usually ask Patrons to support us! Not the other way round! 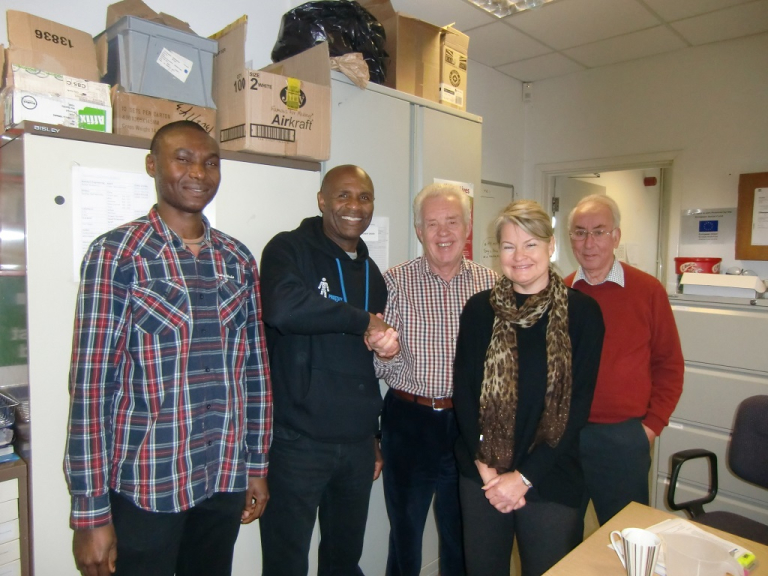 However everybody at Watford Workshop was so happy when Luther Blissett visited us that we want to give him every possible support in his Movember initiative. As a Trustee of Watford Workshop (www.watfordworkshop.co.uk) I invited Luther to come and visit the Workshop. The Workshop is normally a happy place, buzzy and full of energy, but when Luther walked in, the entire place lit up. Some of the usually shy disabled people working there came out of their shells, wanted their pictures taken with Luther and asked for autographs. Luther seemed impressed with the Workshop – he has agreed to become a Patron (alongside our two other Patrons Richard Harrington MP and Dorothy Thornhill, the Mayor of Watford) and he might even come and cook one of his legendary curries for us! Luther works endlessly for Charity and he has grown a (well groomed I am assured – still waiting to see a photo) moustache in aid of Movember, supporting Prostate Cancer UK, a very worthy cause. So please support Luther’s team! Go to http://uk.movember.com/team/1205789 - only a few days left!